Start with practical - get results from the first block. Explore other blocks and then realise you are covering very similar, if not the same, results. what about the surface area of the slices? 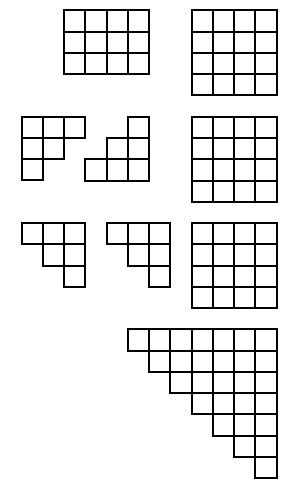 what about the surface area of the remaining block after each cut? what about the sizes of all the eventual slices? Tabulate the results - from simply writing them down in a line to sophisticated spreadsheets. Explore the things in the table. This is where you are really having a new branch of the investigation by exploring a set of numbers from the table in their own right - probably forgetting where they've come from. Perhaps you notice the square numbers that are here. They come together in twos. When you add them to the adjacent non-square number you get a triangular number. In truly investigative mode, we ask WHY? This is where we should try moving from this set of numbers we found in the table back to the practical - looking at where these numbers came from and getting diagrams to help. So we move from the arithmetic exploration to playing around with the practical again. I shall show the practical in diagrammatic form. Here we have the $9$ and the $12$ slices. These two triangular pieces could move onto the $3$ by $3$ square. So the $9$ and the $12$ happily went together to form $21$ - a triangular number! Now let's try the same with the $12$ and the $16$. Here are the four stages. 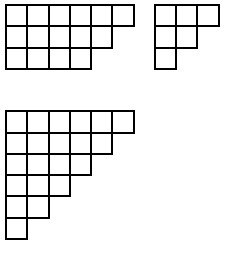 So practically we can appreciate the joining of each square number with the adjacent non-square number to form a triangular number. Appreciating this practically helps many pupils to gain a better realisation of the relationship between these two sets of numbers. "After the first slice [a $5$ by $5$ by $1$] is taken, what's the total surface area of the two pieces?" Sometimes when doing investigations we are very practical and find all we need to without having to go into complicated arithmetic. BUT what happens when trying the " Brush Loads " investigation? Now, as mentioned in the notes for this activity, children count the squares on the surface in different ways. Those who settle for viewing from the four sides and then adding the top sometimes have found out that they only have to consider, in these examples, two adjacent sides. The two adjacent sides are viewed and then added and doubled. Finally the number on the top - the number of cubes - is added on. Now the patterns and arithmetic can be explored further according the the abilities of the youngsters involved. I could imagine some pupils being able to talk about a sort of formula that would be a kind of generalisation. So let's be clear that when working practically we may need to explore what's going on arithmetically and when working arithmetically we may need to explore what's going on practically.